This beautiful family had their name drawn and won a brand new bicycle! In addition they received numerous Christmas gifts including backpacks, crosses and The Jesus Storybook Bible! All in attendance were blessed. 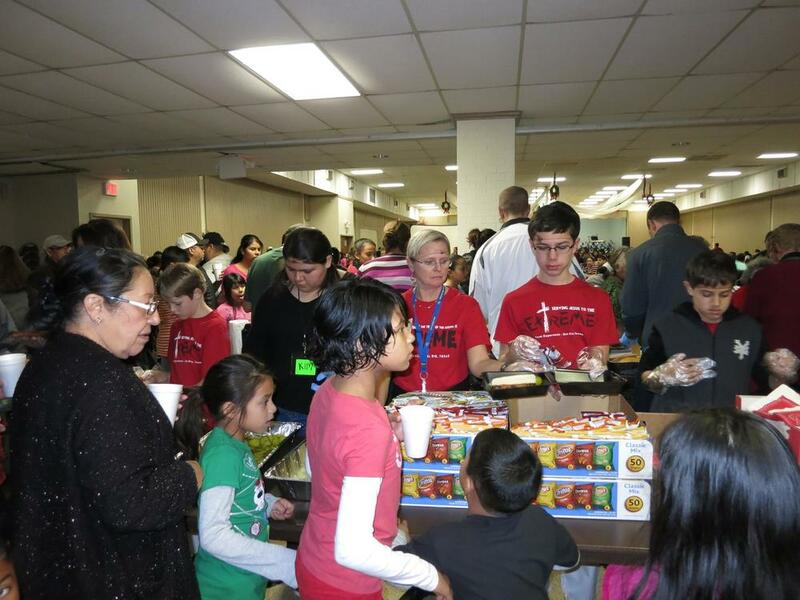 This is what it looked like Sunday afternoon at the Del Rio Christmas Crusade. Tons of wonderful volunteers and guests turned out to hear the "Truth" about Christmas! These are tears of joy as this lady surrendered her sin to Jesus and proclaimed Him Lord of her life! Here is a picture at La Puerta de Esperanza. There was so much clothing, and boxes of pampers and baby items that you guys brought to us that we couldn't figure a way to make it all fit in the photo. Here are our young moms and babies. Yolanda, the housemother, is in the center. The girls were shocked, excited... and blessed... by this outpouring. Please be sure that everyone who made this blessing possible gets to know how much it was needed and appreciated. We are awesomely blessed by all that your teams brought to our little family in Acuna. This is Brother Dennis Carrol with the youth that went on the mission trip in 2015. Missionary Carrol is standing behind the boxes of pampers. Since 2011 AIYM has been organizing and promoting mission trips to the remote towns of Tornillo and Fort Hancock located near the border towns of El Paso, TX and Juarez, Mexico. Since inception, this ministry has continued to grow until it finally outgrew its far west Texas venue. After much prayer, Jim felt The Lord calling the ministry to Del Rio, Texas. A number of meetings with organizers and church leaders in and around the Del Rio area led to a mission trip being planned. Jim began to share the vision with pastors and church elders in Lubbock, San Angelo and Water Valley. Before long, a 60 person team emerged ready to take Jesus & Christmas to the border. A number of training sessions were held over a 4 week period to conduct evangelism training for the volunteer team. During one such meeting a young mother came forward to give her own life to Christ! Praise The Lord! Members began networking within their sphere of influence and soon gathered 20,000 lbs. of food, 4-500 toys, several thousand dollars in cash donations and 1,000 Bibles. The two day evangelistic crusade resulted in more than 20 salvations, pantries filled with food and hundreds of happy children celebrating Christ’s birthday. Upon leaving Del Rio, Jim felt the nudge of The Holy Spirit to “go” and stop by the expansive Del Rio Civic Center for a quick tour. After a brief visit with the Director of the Civic Center, Jim assembled the team to announce that the director was allowing the ministry to utilize the entire 4,000 seating capacity facility for the 2015 “Taking Jesus & Christmas to the Border” free of charge!